← The Easiest Watermelon Snack Ever! Natalia . . . I am childless, but I love to teach and I write/communicate. When writing fiction, symbols are very important to conveying the story. In my mind, the candies in this note were used as symbols most children could relate back to the messages the teacher is trying to impart. S/he seems to want to set a tone for learning in the important Grade 1 environment, which I think this note clearly displays. Perhaps it is unfortunate that s/he wasn’t able to find photographic symbols instead of the real thing, but heck who doesn’t like a welcoming gift (Particularly a nervous, excited new pupil)? Try to imagine what ‘healthy’ items could replace the ones used in the note. I find, at least in Canada, most teachers in our public elementary system spend hundred is not thousands of dollars of their own money for supplies and teaching aids in their classrooms. Penny candy is cheaper (and less time consuming) than making muffins. Perhaps next year, the parents from the graduating Grade One class could donate their time and money to making muffins (or any other non-food items) to replace the symbols used by the teacher this year for the incoming class of 2014? I am certain the teacher would LOVE the support! The teacher is concerned about reaching every child in his/her classroom, whereas parents are concerned with only their child. S/he also has to be able to reach kids who come from homes where sugar/food/treats are the regular rewards. What a wonderful, thoughtful comment and wwhat a great idea for the following year! I will certainly keep everyone posted on how things continue! Thanks for giving this so much consideration! i left a comment but it didn’t make it for some reason. Oh well. My son’s school does not allow any food of any kind in the classroom. I used to think it was silly until my friend’s daughter became airborne allergic and I saw the devastation one Snicker bar can make, even if not eaten. Maybe it’s a good idea to celebrate in other ways than food. Last year, I found whimsical erasers for my son to give out in class on his birthday. I really do love all the compassionate (toward the teacher) comments you’re getting. But if you ask me, it sounds like a BAD omen! In this day and age, with all the junk food being offered up EVERYWHERE kids go, I, of course, feel schools bear the responsibility to teach kids to be healthy. As sweet as her gesture may be, the teacher should not be giving out candy. Especially since the bus driver, the soccer coach, the hair dresser and the bank are also giving handouts, which young kids are simply not developmentally capable of refusing. I do believe in balance and sweets in moderation, but where is the moderation in this world? Thanks so much for this comment! I know you have been working hard to redirect the way your kids’ school does food! And I now finally feel that I have a sensible ally in the class mom to redirect. As everyone has said, it is a lovely gesture, But the candy thing is a disaster and sends the wrong message. If only they’d give out Ferrero Rocher or Godiva…. I really want to plagiarize Marianne. The intention was sweet and it is a small amount of candy. I’m not a fan of schools dictating food choices, healthy or unhealthy. I do think that is a parent’s job and hopefully most kids have established food habits by the time school starts. Still I think that healthy eating can be reinforced and don’t think sugary snacks should be the norm. I think Halloween candy (its my birthday so I want my sweets) is totally different than sugary snacks as a reward. There is a place for everything and balance is key. I did read something recently that I wish I could find about Google. They had offered candy, leaving it around in jars, for their employees. They changed it and began putting healthier choices in with the candy. The healthy choices started to get eaten too. Often, I don’t think there’s choices. I think its typically either or. This teacher meant well. I just hope that if it becomes a regular thing that healthier options can be included. Thanks so much for weighing in! Talk about balance,,,because we had a very sugar crazy kindergarten experience, and because I spend so much time making healthy food and lunches for us both (and kind of resent the school lunches for not being good enough — in my mind – to use as frequent back-up), I have a near-panic reaction to any sweets being sent home. I thank you and all the others for talking me down! I don’t have kids yet, so I don’t know how I would react as a parent in this country. My parents always let me eat as much chocolate/candy as I wanted, and somehow I managed not to overeat, but obviously this doesn’t work for everyone. 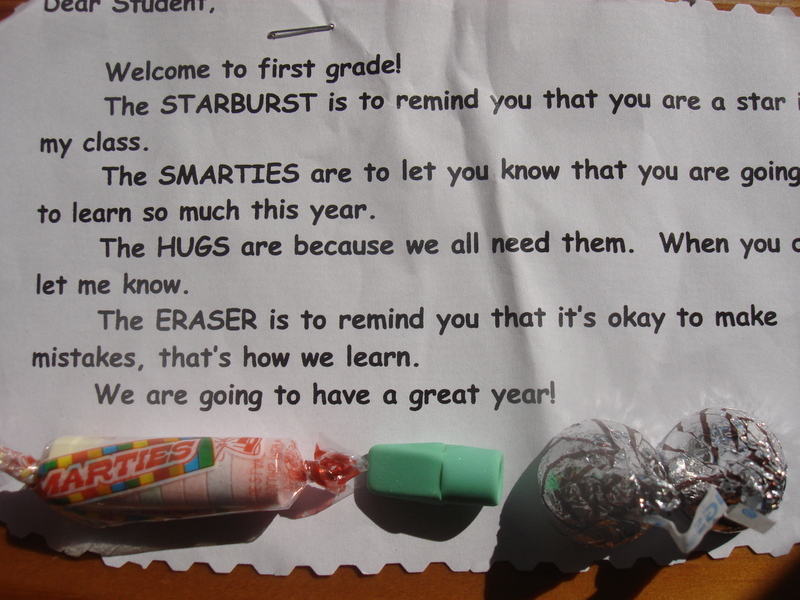 I think the note is cute and there isn’t much candy, so unless you notice lots of candy gifts throughout the year, I don’t think it’s worth fighting the school over it. I love the fruit salad idea! Since I started running, I did notice the need to eat more carbohydrates in order not to feel miserable, so I think some carefully picked more carbohydrate heavy snacks could be a good idea for super active kids. For us growing up sugar desserts were a treat, but definitely not the norm. And my brother and I were the only ones who had whole wheat bread and fruit in our lunch bags. But we also had Ring Dings sometimes! Balance is key…..
My son’s school does not allow food at all. No holidays, birthdays, nothing. You can send in crafts, stickers, pencils. I love it for allergic kids and it allows everyone else to monitor what their kids eat. In pre-k he came home with so much junk. Halloween he came home with a dozen bags of candy. Principal said if you send in food to be shared it will be sent home. I was happy about the policy. I would be happy with that policy too! But since our policy is different, I hope we can effect positive change without being Dreaded Sugar Police! As someone who works in an elementary school I know that this is a gesture of goodwill and welcome. The meaningful poem attached to it supports this. It’s not a staggering feedbag of candy and it’s followed up by a fruit salad to acknowledge the importance of good eating. Now if there was a king size Snickers in there, you might have a problem! Not a very big one though, since it happens to be my favorite, and I could always take it off of your hands. As for what my kids were served at school, I didn’t really have too much concern. They had to make choices on their own. I served balanced meals at home and had a variety of snacks. Some healthy, some not, but I stressed the importance of balanced eating. I feel that I can’t rid the world of bad food, drugs, or other unsavory teen traps, but they need to know good choices are important and hopefully they continue to make them. I know how absolutely sensible you are on these matters. I also don’t have a huge problem with this welcome back gesture, but am hoping that this year the parents in this class can help foster healthy eating. The class mom really wants to work that message, so I think we can be cool about it. Leandro had a great time making melon balls for the fruit salad this morning…and I STILL got to work on time! YIKES! Just yesterday I had a conversation with a mom who was criticized for bringing sliced oranges and water for a first grade soccer team snack, claiming the kids needed more sugar at that time of day 😦 and another mom saying “good luck with that snack, kids won’t eat that!” Double yikes!!!! OMG, that almost makes me want to cry!! I don’t have any biological children, though I do have a now grown up step daughter, whose father had a whole foods shop and later a restaurant. He did influence what I eat (even now) because he gave us lots of wholemeal spaghetti and brown rice, which I quite like. Anyway, I don’t remember her being sent home with candy. There doesn’t seem to be much candy in the gift and it has been thought out. I do like the request for fruit at the end of the first week. Personally I would object if the school gave my children candy on a regular basis – that decision should be down to the parents. Thanks for getting things started off! I am also very happy about the fruit salad. And the Class Mother (a parent who helps out the teacher is very interested in encouraging healthy snacks in the classroom! The Class Mother sounds like a very good influence. I think that parents lead on this kind of thing, but there can be conflicts as Pam mentions below.